What is your preferred iOS app for RSS? What’s the one feature (or two or three🙃) that makes it work for you? I prefer lire by Fliper. 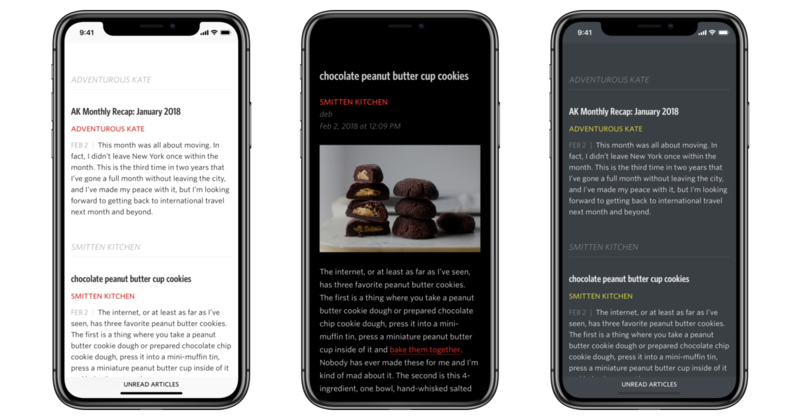 I like the layout of the article headers and the full-text view of the articles themselves, as well as the easy integration with Pocket, my read-it-later app. I like a clean, easy to use interface, and Feedly fits the bill for me on the Mac. For iOS, I use Reeder. It has easy to use left or right swipe options to save, delete, etc. I’ve tried quite a few but always end up back with Reeder. Just the right balance of features and a very nice, easy to use design. Nice theme options and customization. I’m using Unread. It looks really nice and functions well. I don’t subscribe to a lot of feeds so triage is t that important to me. I can see it would a tough app to use with a ton of subscriptions but it works well for me. I use Reeder with Feedly as a back end. I preferred Mr. Reader on iPad, but alas it is no more. Clean interface, integrates with all my services, easy to navigate. Gets the job done. Mr. Reader is long gone, but a wound is still fresh. I’ve settled on Fiery Feeds. I’ve used Unread for several years, love it. I subscribe to nearly a hundred feeds so I spend a lot of time in the program. I was quite jazzed to meet the current developer at WWDC earlier this month, nice guy. Given the chance, though, I couldn’t really think of any suggestions for improvements, it already works pretty much the way I want. Happy with Inoreader, both the service and iOS app. I purchased Unread but always seem to be back to Feedly (App) on the iPad and Feedly in the browser on the Mac. Reeder on all platforms using Feedbin as my back end. It’s hard to pin down one or two things that make me stick with it over others. Occasionally I will try something else, but I always end up sticking with Reeder. It just seems to work the way I think it should for me. I am still using Unread. Interestingly, I haven’t use an RSS app on the Mac for years. Lire because it actually downloads fulltext immideately. Was a Reader user for some yers before. Interestingly, I haven’t use an RSS app on the Mac for years. I just use the Feedbin web site for RSS on the Mac. It’s excellent, and everything stays synced with Unread on my iOS devices. I’ve been using Feedly for a while now. Can someone explain why you’d use a separate reader like Reeder instead of just using the Feedly app? Fiery Feeds. Because it’s the only one that supports Tiny Tiny RSS as a backend. I’ve been on the Unread train for a while, but just purchased lire to give it a shot. I’m enjoying it as well. Not sure if I’ll keep using it or move back to Unread though. I live in a mixed world! I rarely read RSS on my Mac. When I do, I simply use the Feedbin.me web site. It works good enough for those rare sessions at the Mac. 99% of my RSS consumption is on either iPad or iPhone. My app interest is always biased towards very quick review (ie, easy access to summary of new entries organized by category). For years I’ve used Unread on my iPhone. I like the flow between the Tags view and the articles view with the slide up gesture to mark as read. Works well on the iPhone screen real estate. Reeder has been my reader of choice on iPad. It, too, has a clean and simple interface. I like its multi-pane view on the larger screen real estate of the iPad. I am using an RSS client just to triage articles, actual reading is done in Pocket. For this task, Feedly fits the bill perfectly - long press on the article title in the list saves it to Pocket.